Another one of those former AcceleRacers castings, the Piledriver originated in the Metal Maniacs segment of that line. 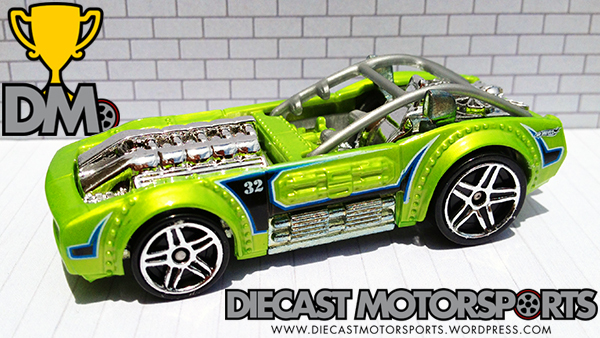 Driven by Deezel “Porkchop” Riggs in the cartoon, it is named after the wrestling move of the same name (according to the Hot Wheels Wiki). It has a V10 engine along with several “boost” tanks on the sides. The rough exterior also exhibits rivets that “attach” the wide-body fenders and roll bars across the top of the vehicle. This version of the Piledriver was found in the Track Aces 5-Pack in 2009 along with the RD-05 we already featured. Its a great track vehicle hence its insertion in this 5-Pack. If you have track sets, these Track Aces are great cars to run through them as they were deemed “Track Aces” specifically by the Hot Wheels designers. RELEASE DETAILS: Light Green Body (plastic). Chrome Interior. Gray Roll Bars. Chrome PR5 Wheels. Unpainted Metal Base. Made in Thailand. Toy# N4079. Released in 2009 as part of the Track Aces 5-Pack.